The Dungeons brings together an amazing cast of theatrical actors, special effects, stages, scenes and rides in a truly unique and exciting walk-through experience that you see, hear, touch, smell and feel. It’s hilarious fun and it’s sometimes a bit scary. 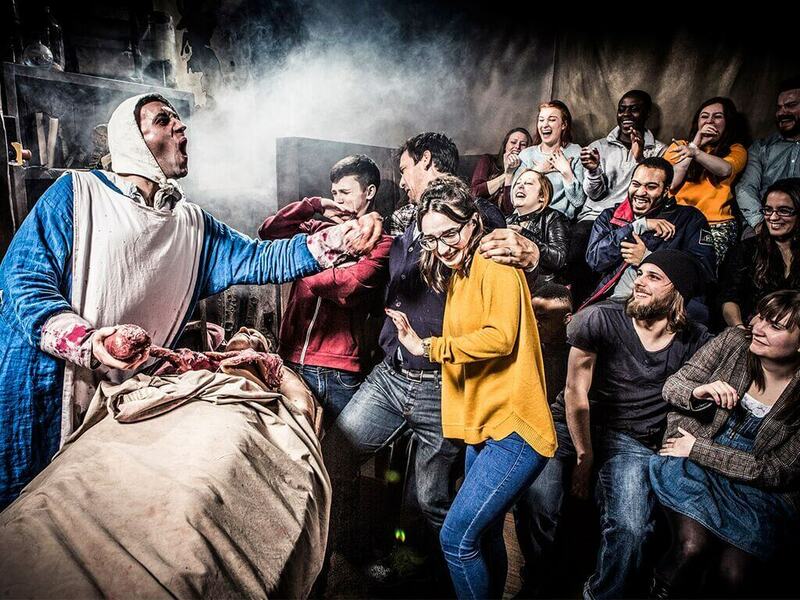 On your gruesome journey through the city's past you'll experience 19 live shows, 360 sets and 2 underground rides. • Pre-booking for groups recommended to avoid further queues. • Book online to receive a discount. of an emergency evacuation it is not possible for wheelchair users or guests who have considerable dif culties walking, to access The Tyrant Boat Ride and Drop Dead – Drop Ride to Doom. • Due to the intense nature of Drop Dead – Drop Ride to Doom guests who are unable to brace themselves unaided are not permitted to ride. You can experience The London Dungeon after-hours with their Lates events - which includes a free drink from the Victorian Gin Palace and an accessory to be worn throughout the tour. The attraction offers a proposal package which includes a personalised tour of the Dungeon.